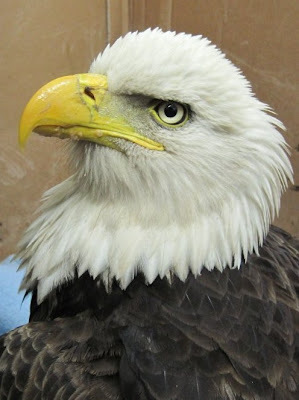 We have updates on our Bald Eagle patients. The photo above is "Trapper," the adult Bald Eagle that was caught up in a trap in October. He continues to improve. He does not yet have full movement of his toes on the left foot due to the swelling. He is using the foot, however, and we remain hopeful he will regain full use of his foot. It is a long process for the tissue and the nerves to repair in a compression or crushing injury. News reports from the recent earthquake in Haiti brought to light the horror of crushing injuries suffered by victims of the quake. We read about shocking field amputations of limbs. 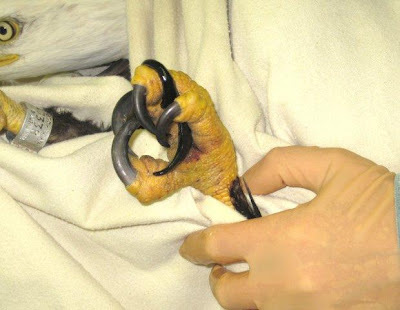 It is the same kind of injury a leg-hold trap causes on the foot/leg of a trapped animal. Before anyone gets upset thinking I am comparing the horror of the earthquake to our patients, I am not. It is just a reference, since the serious type of injury to tissue and nerves is involved. When nerves and tissue have been too long without circulation or the injury to too severe, the only option is amputation. (Photo: The treatments for injuries suffered by leg-hold traps are varied. They are all labor intensive for both the patient and the REGI staff. 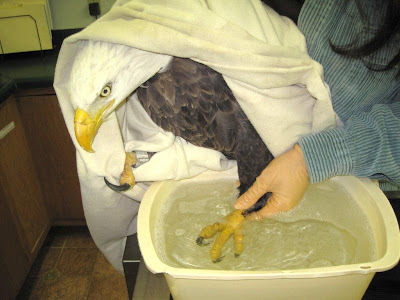 Here the adult Bald Eagle admitted last week has his leg soaked in very warm water to stimulate circulation to the affected leg and foot. Just as each of our patients is different, so too are their injuries. While all leg- hold trap injuries have similar problems, some require more intensive or creative approaches to give the best possible result. We are constantly trying to improve our techniques and in some cases try new approaches to the medical problems. Recently, we started using leeches on the feet of patients with crushing injuries. The jury is still out as to the success of the new treatment. We hope the leech therapy will increase circulation and shorten the time the birds spend in rehabilitation. We have several patients we are using leeches on, including the Great Horned Owls with trap injuries. Leeches, and age old therapy, are being used more frequently in human medical practice...so we may find success. We hope so. I will leave you this mornng with a fun photo. 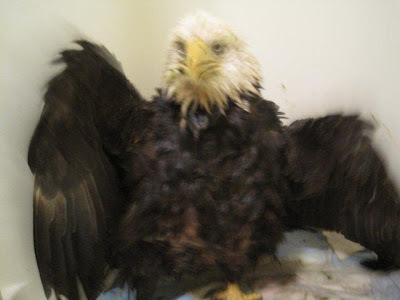 This is the Bald Eagle admitted under the title "Double Whammy from Marathon County." Birds love to bathe. When they are indoors in intensive care or winter quarters, it is hard to have tubs or pools large enough for them to bathe on their own. Instead, we put them in a shower and they have learned to use it for their bathing needs. They enjoy the time in the shower, as you can see in the photo above. We have had several new admits this weekend, including another lead-poisoned Bald Eagle. My camera had an accident the other day, and we were not able to get any photos for you. I will soon.